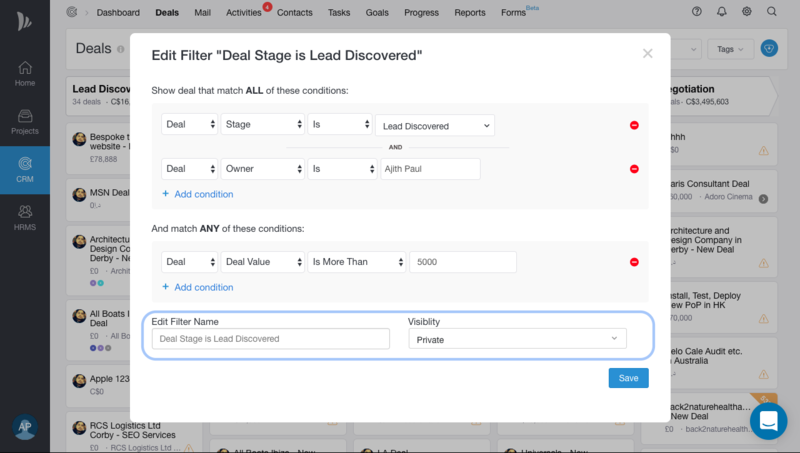 Filters will help you narrow down your results by Status of a Deal (Won/Lost/Open) or Deal owner or both in Deals page and by Contact owner in the Contacts page. You can also create custom filters to match your requirements or a set of conditions in Deals, People and Organisations page. 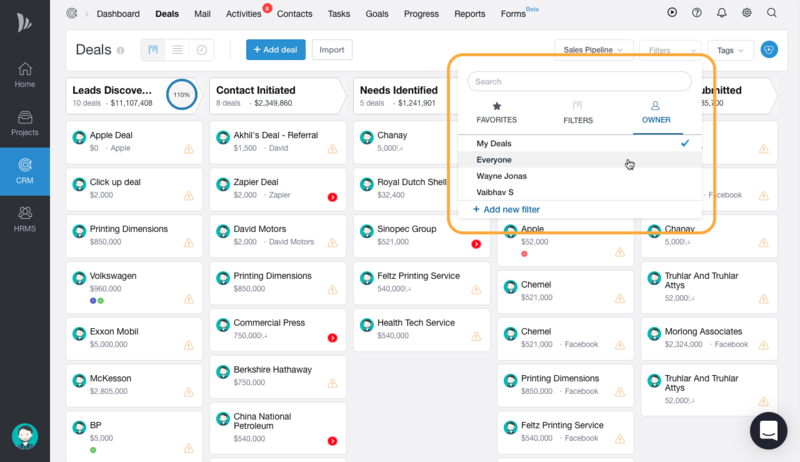 So, you can mix different set of fields and define a filter to see what exactly you want to see in your CRM. 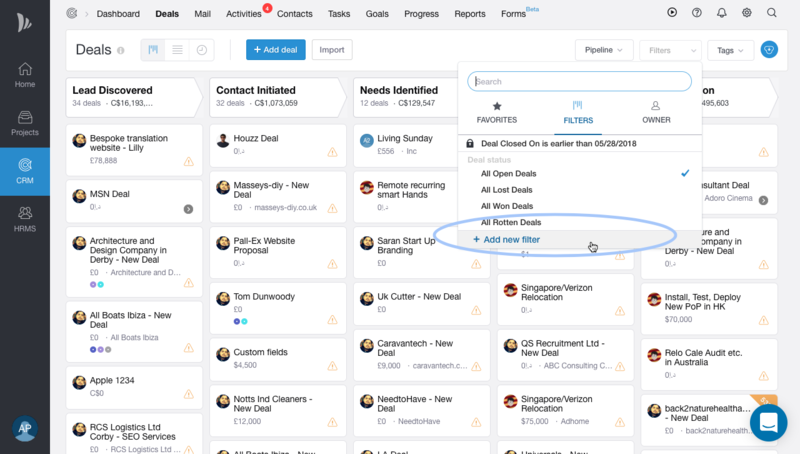 All the deals in a specific stage of a pipeline which has no activities scheduled. People who are not associated with an open deal. All the deals from Australia whose deal values is less than 2000 USD which are led by one of your employees. 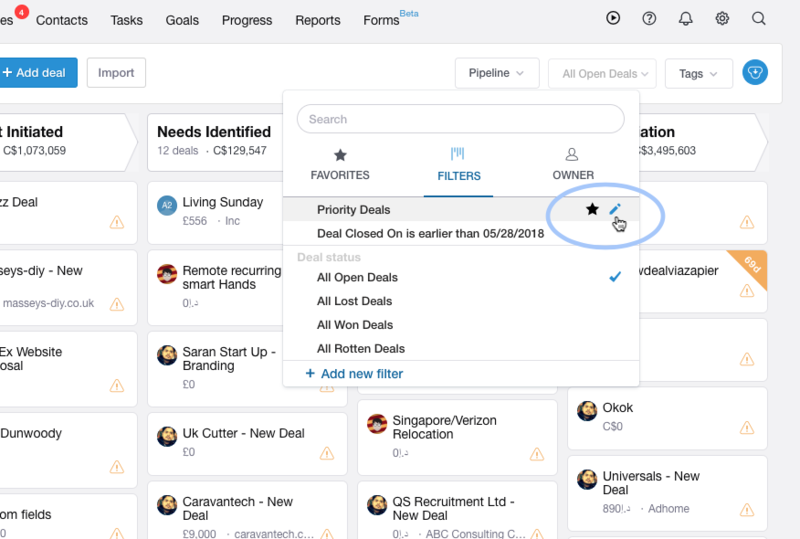 Go to list view of Deals, People or Organisations page you would like to filter. Click on the Filters button. You can set a name for the filter you have defined. Using ALL and ANY conditions you can define any filtering condition as per your requirement. ALL conditions: If you want a filter where it should satisfy all the defined conditions, then you can add all those conditions in ALL. ANY conditions: If you want a filter where it should satisfy at least any of the defined conditions, then you can add all those conditions in ANY. You can also define filters using both ALL & ANY Conditions. Here the result will be common results of both AND & ANY. Which means, it will satisfy both the set of results of ALL & ANY conditions. Click on Edit icon on that filter you would like to edit. Change the name of the filter if you wish to change its name. You can set filters as favourites by clicking on Star icon. You can choose a filter to be Public or private in the Visibility section. For all private filters, a lock icon will be shown next to the name of the filter.